It’s parade day in New Orleans. The sun is out and it’s about 75 degrees outside. From my window I heard a horn playing. It’s going to be a magical day. 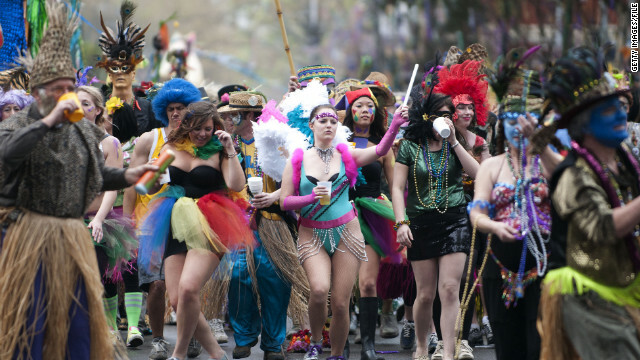 So, I won’t be able to see Krewe of Cork, Krewe of Oshun, or Krewe of Cleopatra. Oh, but I’ll be back tomorrow St. Charles. You know I will. I think there’s a bear mauling a Mardi Gras Indian in this photograph. That’s different. Sunday is Krewe of Barkus, which you are correct to assume is an all canine krewe. I’ve wanted to see it in the past, and this year I’m making it happen. I would bring Fitz, but he would most likely lose his little freaking mind with all the dogs around on leashes. We would never be allowed back. Ordinary Men. Extraordinary Moves. New Orlean’s one and only all-male dance crew. Where is that one poem about Brooklyn? Janine, I can't get enough! Enter your email address to subscribe to this amazing blog now! Do it.